Ah, the rugs in our kitchen. They were $34 from The Company Store ages ago (maybe 2008?). 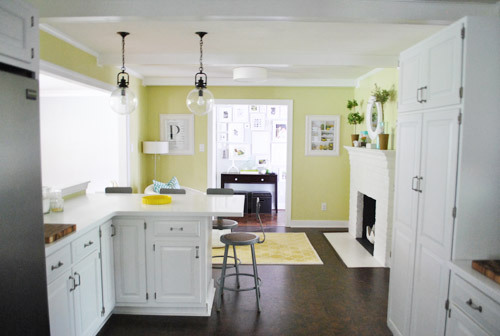 They originally lived in our first house’s kitchen and third bedroom, and they’re awesomely durable and neutral – but they don’t really do anything for the new kitchen (in person they’re a little too small and sort of clash with the avocado walls since they’re so honey-oak-colored). 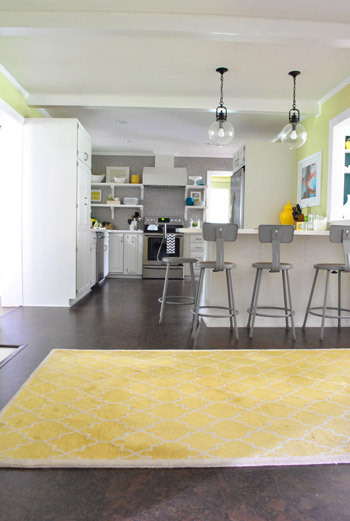 So “find a new kitchen rug (or rugs)” has been on our lingering kitchen to-do list for the last couple of months. We decided to tackle this rug situation – well, more like it decided to tackle us – on a recent stop at HomeGoods. 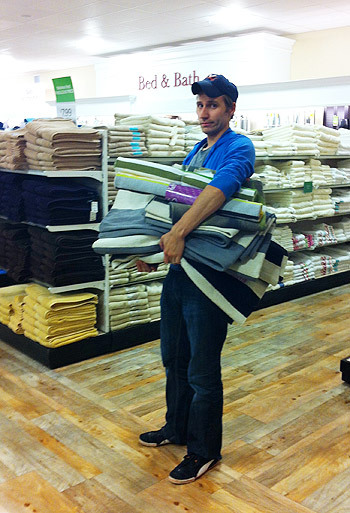 Sherry found a pile of awesome 5 x 7′ flat weave options for just $49 each. We saw potential in a lot of them so we lugged them home for what Sherry cheerily dubbed our “kitchen rug fashion show.” As for me, I prepared myself for lots of rug moving – so a disclaimer upfront that the rugs in the pics to follow aren’t perfectly placed, nor are they wrinkle or tag-free (we just threw them down, gauged our reactions, and snapped pics for ya). In an attempt to spare myself a lot of work, I suggested we start with what I thought was guaranteed to work: a bold black and white stripe. In my head this was the perfect solution. It became quickly clear that I was wrong. 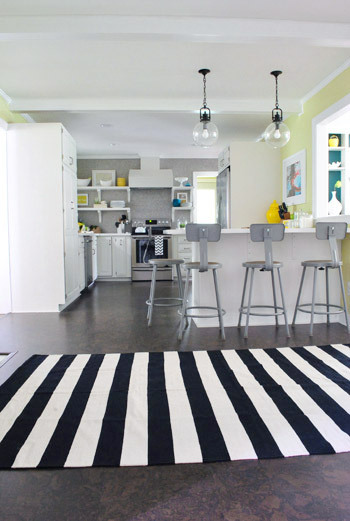 … that change wasn’t enough to save the black & white rug as an option. In person it was even crazier/more chaotic to look at. But it did confirm that we wanted just one rug in the room (in the living part) since they would have to run different directions to make the most sense – and almost any rug would look odd running length-wise in the cooking area and width-wise in the casual fireplace zone. Eliminating the competing pattern (since they’d be oriented in different directions) also helped to reinforce that the fireplace side was a living / relaxing space. Our next try was with a similar option HomeGoods had – a more subdued gray on white stripe (I wasn’t ready to give up on stripes). We did like the gray because it sort of carried the gray backsplash over from the other side of the room. But I think it put the nail in the coffin for large stripes. It was still too high contrast for the space and felt sort of cheap and just plain wrong in person. With my theory about the stripes sufficiently proved wrong, Sherry suggested that we try her favorite rug. It was an ikat-ish diamond pattern that was made up of some of our favorite colors. She also thought the dark colors would keep it from being too jarring against the dark floor. It did seem to work very nicely with the dining room curtains, which are visible from one view (check out Sherry’s hastily draped dishcloth pillow cover in the corner to help tie things in) and it helped her visualize the potential color scheme of that side of the room. But ultimately this rug got the axe too. The pattern felt too distracting – perhaps because it was still relatively large scale – and the colors felt a bit circus-y in real life (it actually photographs better here than it looked in person). Sherry was bummed, especially because she had found a matching runner for the laundry room (which also has the same color scheme as the kitchen and is attached to the other side of the room). Meh. We deemed it too light – and the off-white color just looked dirty in comparison to the white counters and cabinets in the room. Back to the closet for you! And even though we were over the in-your-face patterns, we also gave the old Pottery Barn “Clara” rug from our old den a shot – just to be sure. 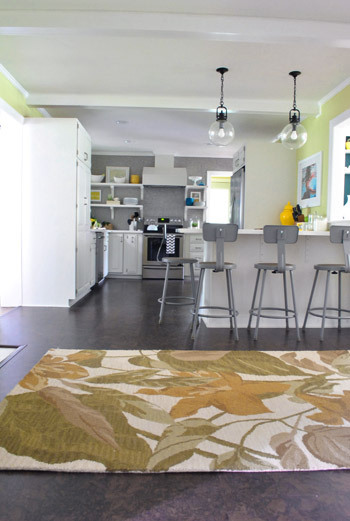 We still love it as a rug, but the pattern and color are totally wrong for our kitchen. Once again (like the original jute rugs from The Company Store) the honey-wheat tones were all wrong with the soft avocado walls (which we hear can read differently on many monitors, so our apologis if they look yellow or neon green – they’re really the color of the inside of an avocado- very light and subtle). Sorry Clara rug. At this point we started pilfering things from other rooms, like our all time favorite yellow moorish Pottery Barn rug from the guest room. We were actually feeling this one a little bit. We liked that the sophisticated pattern wasn’t too high contrast. It didn’t scream for attention like a lot of the other larger-scale rugs had. Our only hang up was that the yellow clashed with the walls. Even though we love the other yellow accents around the room, it just wasn’t working (it was a little too orange in person while the walls have green undertones). Of all of the colors we tried, we actually thought that something gray could be the most natural for the space (it’s not clashy with the walls, it would tie into the wall of tile on the other side of the room, etc). The yellow rug is still living in the kitchen just-for-now, but we’ve both agreed it’s not permanent. So I guess we still have more rug shuffling in our future, but at least all the shuffling in our past wasn’t a waste. We learned some important things about what we’re looking for: mainly a light, subtle not-too-large-scale pattern – possibly in gray to reference the backsplash and bring that over into the fireplace side of the room. We actually used this criteria to hunt down another rug that we think will be perfect. Cue the choir of angels. The only sad thing is that it’s on order – but once it arrives and we have photos to share, we’ll be able to tell you whether or not we were on the right track. Fingers crossed! In the meantime, what did you guys do this weekend? Any rug shopping? I hope there was lots of family time too. We got to log some of that – and although four children under the age of three sounds like a recipe for disaster, it was great to have everyone together. I rather like the Ikat one. Yeah, it’s a bummer it looked better in photos than in person. I wanted to keep it so bad, but it just didn’t work! Mayhaps a grey and white ikat? That pattern was great! Ooh I would love that! Ooh that’s pretty! We’ll have to see if the one we have on order works- and if not I might show this guy to John. I’m in the love with the one we ordered though so I hope that one works! 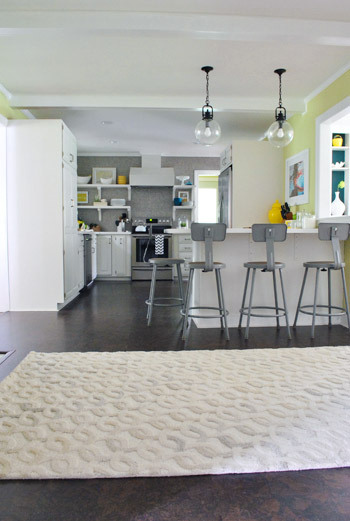 I am SO bummed that the cool green/grey diamond pattern rug didn’t work (and you’re right, it totally doesn’t). It’s pretty spectacular though. 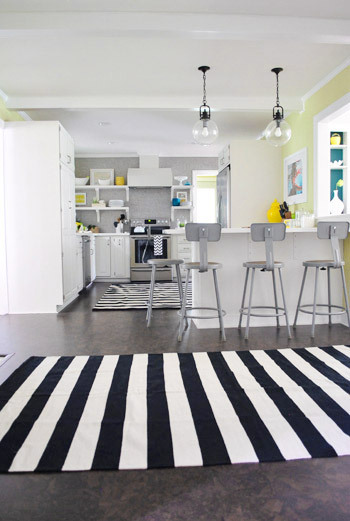 I really love the striped rugs. Ooh camping sounds fun. Is it weird I have fond memories of eating bland chicken after going camping with my friends (we forgot to pack salt- and it was desperately needed, haha). Really take a look at these pictures for a moment. I think your scale is off with these rugs. It seems like you might want to try something larger- wider than the fireplace. These rugs are just slightly smaller and it’s looking strange. Perhaps that’s the real reason nothing seemed right. Maybe the next time you do a rug fashion show, you could try and 8×10 and see if you like that better. I’d hate for you guys to fall in love with a print to realize months later that the scale still feels strange (like the green rug). Hope this is helpful! Oh yes, we actually tried a few of sizes (some are 5 x 7 and some are 5 x 8). Anything wider would get bumped by the stools when they’re in use- which would annoy the heck out of us! Haha. We tried a 6 x 8 one (not for color, just for size) and it was sadly way too wide to be functional. I agree that none of the rugs were *the one* for your kitchen. This is a situation where deciding to be patient will pay off, as you know that if you rip the tag off of one of the Home Goods ones, the perfect rug will suddenly present itself elsewhere. I did like the Ikat-ish one, but if it looked different in person, then never mind. I spent my weekend working, watching rain from indoors and thrift store shopping. I bought an adorable vintage magazine stand for $2 that I am figuring out what to do with. I do still have rug envy from your bedroom, though. It’s painful, but I’m seeking treatment. Yeah, I loved that ikat one and wanted it to work so bad, but I totally know what you mean about compromising and ripping off the tag and then finding the perfect thing, so we decided it was definitely the better move to hold out since my ikat guy was too crazy in person! I love buying a bunch of something to “try out” at home, but I don’t like when none of the options work…….I guess you have to start somewhere…..
Wow that is a lot of rugs to try out! You guys are so lucky you live close to stores you can do that with! Being 4 hours away from stores that sell decent rugs makes decision making hard!! I can’t wait to see the rug that you have on order! I think those rugs would look much better if the wall paint was a different colour. That’s probably true but we love the wall color more than those rugs so it won! We’re no strangers to changing the wall color if we fall in love with something that doesn’t work with it- but so far that hasn’t happened! The cork has some texture to it, so anything too busy competed with the floor as well as the walls! My family & I went accidental rug shopping this weekend. We went to Furniture Row to possibly get a table & chairs (weren’t what we were looking for) and found a rug we *hope* will be a perfect fit for our new home. Plus we also stumbled across a clearance tv console that will be a perfect fit for our fish tanks, so we killed 2 birds with one stone that we weren’t even ready to throw yet! :) It was a great weekend. Once you pick a rug, you should paint the seats of the stools! 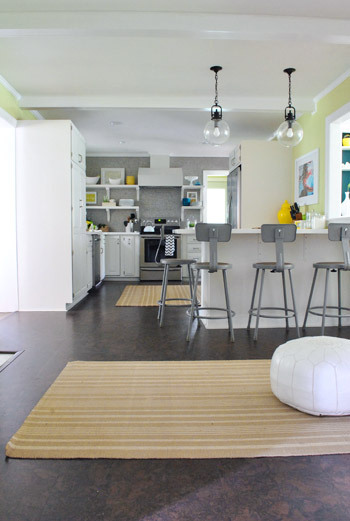 I love the stools, I think they pick up the gray of the backsplash – so maybe if you paint the seats something to tie the rug in, they will flow nicely. Oh yes, we have plans for those guys! This is one project I’ve been eagerly anticipating! We bought a rug this weekend too! It was 60% off, but it is on backorder. Sorry your in-house rug shopping didn’t work out. Rugs are actually very difficult – at least for me. I’m actually kind of worried after looking at your post because the rug I got has a big pattern. I’m hoping it works out and isn’t too over-the-top. I figure since it is for a long hallway I could get away with it. Besides, it has to be better than nothing, and it was so cheap I can live with it for a while. Can’t wait to see yours! I have a feeling I know what you might have purchased. It will be interesting to see if I was right. Oh no, don’t be scared of patterned rugs! We love the big large-scale rugs in our bedroom and living room, so that’s why it was our first instinct in here- they can work so well in some spaces! Hope it’s awesome when it arrives! Dagg, hating on the stripes??? I love them! (but I think I loved most of your choices). I see why you think it’s too visually demanding though (although that description made me laugh). 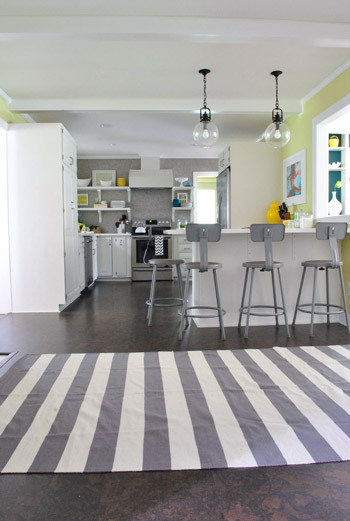 I need a post on kitchen rug placement (and how to keep them clean). I have a kitchen in need of rugs but I’m not sure where to put them. Haha- I laughed when John wrote “visually demanding” too. I think his words to me were “hard on the eyeballs” – haha. Personally, I love the stripes, they both looked great! But I’m sure you two will pick something perfect! That’s from Joss and Main on clearance a while back! They go on sale pretty often (maybe once a month there?) and my friend in NY even ordered a cute blue one and sent me pics. My ottoman is friends with her ottoman. haha. Wow- that sounds like lots of work. I bet they’ll look amazing when they’re all hung up! Aww, poor John! haha. I did like the grey rug the best, not the stripeyness, but the color looked like it went well with the rest of the kitchen. Can’t wait to see the finished result! Can’t wait to see it! I was thinking something gray or muted blue would work. Good luck! I must say that I liked the black and white stripes. It gave your kitchen a very modernist vibe. I can’t wait to see the one you actually picked as THE rug though! The whole rug idea really works well to define that area as a living area, as you mention! I’m loving the black and white actually. It’s playful and a nice break from all that grey, but still relates. I suggest you wait to decide on a rug until you ORB the bar stools. ORBing them would help tie in the pendants and give the room more depth of color, imo. We actually photoshopped that into the room but it was sadly the same thing – too crazy for the room (and as you mentioned the off-white looked sort of dirty compared to the clean white cabs/counters). I’m sure it looks awesome in other spaces though! I actually like the black and white in the photos, although you need a little more contrast higher up (near the ceiling or the stools) to make it work. Are you still considering refinishing or painting those stools? Maybe if you did them in black it would tie the rug in better. Oh yes, we have plans for those stools! In the pics the grey & yellow ikat looks nice. I have a similar rug I picked up from homegoods that has been riding around in the trunk of my car for 3 months. It didn’t work in my kitchen and I keep forgetting to take it back. I bought 4 beige chairs for the living room yesterday. I plan to do a grouping with either a round table or ottoman in the middle. 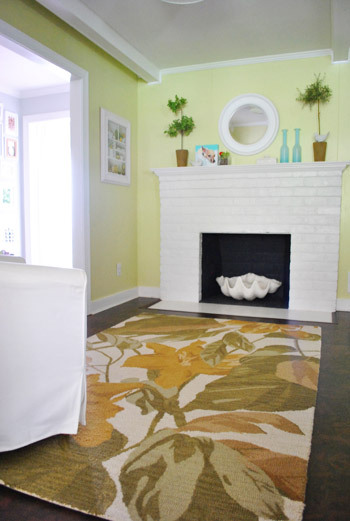 I am searching for a rug before I pick out the paint color. So far I have been to Home Goods, Home Depot & Ollie’s. I looked at a rugs for sale book at the furniture store. I’ve looked at Overstock. No luck. I will be trying a different Home Goods today. I’ll check the RugsUSA that popped up on your site. Any other places/suggestions? Garden Ridge has good ones too! And of course C&B and CB2 and Pottery Barn have good sales sometimes (and their outlets). I think you really need a bright color actually… like a turquoise blue. It would tie into your accents in the kitchen, and also the peacock color on your book shelves. You already have so much grey and yellow going on in there..
We photoshopped some bright teal or turquoise ideas and it was a little to jarring. We think it needs to just layer into the room and not demand too much attention since there’s other stuff going on like open shelves, beams, cork flooring, penny tile to the ceiling, giant pendants, etc. Ya know? We did some demolition work in our bathroom this weekend. Our house is built in 1959 and the last bathroom renovation took place in the 70s… so everything will be thrown away and the plan is to install a new “everything” over the next couple of weeks. I’m so excited! Wahoo! Good luck with everything! We have been doing something similar in our living room. 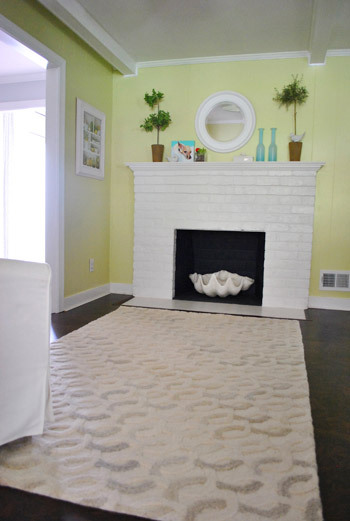 We finally found something very simple that we loved….a jute/wool mix rug that we adore. But alas, the wool part of the mix is not holding up to our labs nails…:( After just a couple of days it started to snag, so it will go up to our third floor sitting area where she is not allowed. I think to achieve the same look we will have to have sisal. Scratchy I think, but hopefully indestructible. Good luck! 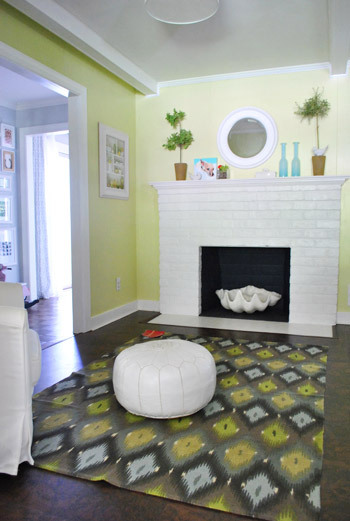 I dunno… I love the ikat-esque rug! Actually, it would look pretty darn good in the Little House’s dining room now that I think about it. Can’t wait to see what you ended up ordering. Are you returning all the other rugs? Yup, all of them got returned except for the leftover ones we own from our first house (rolled up in the playroom). Wish that Ikat one worked, but in person it wasn’t nearly as cute as the photo – just sadly too busy. I actually really like the grey stripes. But I pretty much like everything grey. We’ve been furniture/home shopping a lot lately and my husband teases me that our home is going to be “Fifty Shades of Grey” which just grosses me out to no end. One of my very best friends got married this weekend, so much of my time was spent at the rehearsal dinner/wedding etc. I actually did an original reading at the ceremony, which I posted about here. Wahoo! So glad you told that reading who was boss. So sweet! I love the pottery barn rug. You should look in to getting one of the other colors it comes in. I think they even have a nice blue. 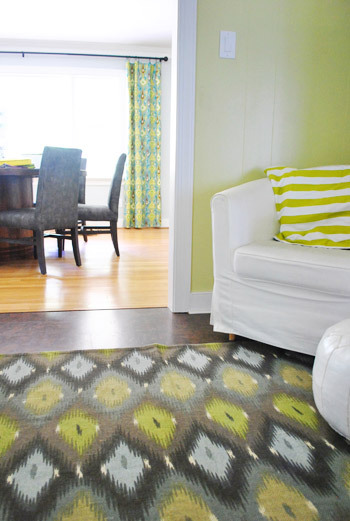 Through your rug experiments, I’m definitely learning what styles of rugs I like – graphic patterns in bold colors! Which is good news since our floors just got refinished (completed on Saturday – woo hoo!!!) a deep brown and I will definitely be scouting rugs soon! 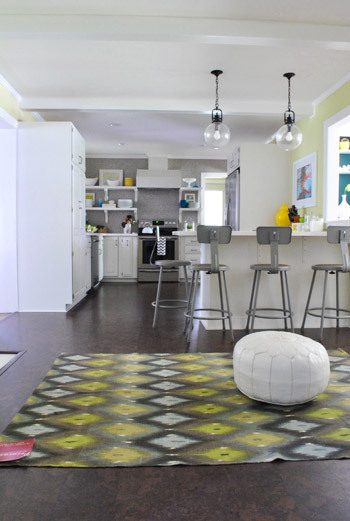 I love, love love the ikatish rug and think it looked great. Are you sure it wasn’t good? I loved it. Did a DIY this past weekend. I spray painted a garage sale wicker chair and made new cushions. I am not a great sew-er…but I did great. Very neutral colors so I can change pillows on it frequently. 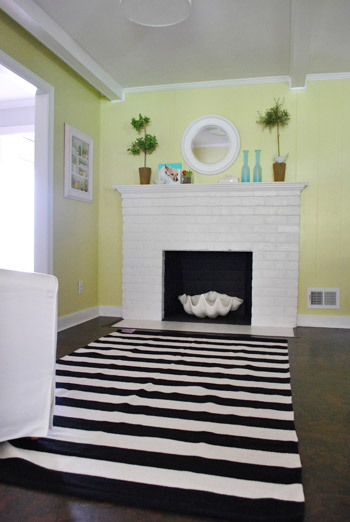 Next DIY project is paint the brick cream color on the fireplace…can’t wait!!! Once again…loved that rug, Sherry!!! Haha, yes! I promise you guys I wanted that rug to work more than I wanted a dozen oreos (which is always what I want). Sadly in person it was totally not working. I wish it looked as good as it does in the pics in real life! bummer! i always love the bold rugs too, but they’re so difficult to make work in existing rooms. i think a circular rug could look really great in that space too! good luck!! 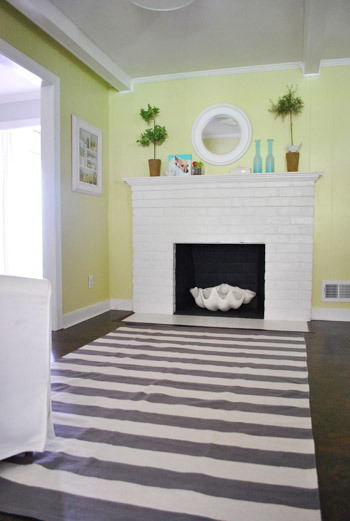 I actually quite liked the striped rugs, and the ikat one. But hey -ho you will know when you find the right one. We bought our rug in the livingroom in a closing down sale and it’s just a bit too small so we keep talking about replacing it. Aw, so glad you had a sunny weekend all the way out in Scotland! I spent my weekend at the beach where I think I spotted John on the boardwalk? I feel like such a creeper even writing this…but I recognized that UVA hat! Hope you guys enjoyed the beautiful weather! Haha- that must have been him! Love the way y’all try to figure out what works. Makes me realize that I am not alone in “knowing” what works before I actually see it in the space. My friend has it in gray and really likes it. Plus, they’re currently 35% off with free shipping! I actually checked that one out before we ordered the guy we chose. It’s definitely another contender if the one we ordered doesn’t work! I bought the gray and white one from Home Goods on clearance for $35 last week! I put it in my living room and it worked well with my blue/gray couches… It looks awesome there and is helping the living room come together… Good luck with your russian roulette of rugs! I love the Ikat diamond pattern rug. 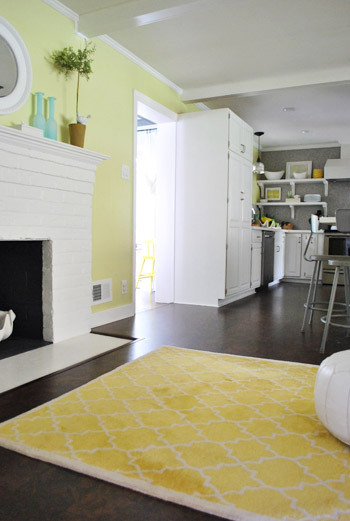 Your kitchen walls really bring out the bright colors in that rug. Just lovely!!! What about the jute one that used to live in your bedroom? Is that one too giant? Yup, sadly waaaay too big! I also agree with this. I get that it is too big, but what about that color combo? I wish the IKAT one worked! Maybe a grey version of it if possible? Can’t wait to see where you end up! What are your thoughts on rug under-pads? Our rugs always slide all over our hardwood floors. I tried this DIY tip I found on Pinterest with caulk on the underside but it failed. Yes, a gray version of the ikat would have been awesome! We always use a rug pad under thin rugs, just to keep them in place and make them a little softer for beansie. We get them at Target (also helps to put things on the rug to hold it down like a chair + ottoman). I never considered the rug pad having other benefits besides the sliding around factor. They make it softer… genius! I bet it has a dampening effect too – should mention that to our upstairs neighbors! lol. Rugs can be so hard to find sometimes! I love the bamboo one we have in our kitchen though, even if it doesn’t match very well. Have you guys tried Garden Ridge? There is one in the Chesterfield Towne Center mall and we bought all of our rugs there. Ooh yes, I’ve been meaning to try them since they have so many and such good prices! If the one we have on order doesn’t work out we’ll have to try that! I hate rug shopping! Can’t ever seem to find just what I want. 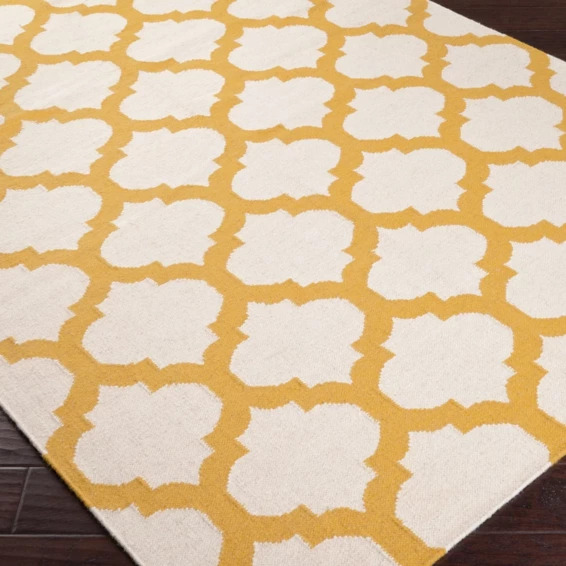 Case in point – I bought this rug in yellow from Shades of Light because it looked so perfectly yellow and (nearly) white to fit in with my “safety yellow”, white, and gray guest bedroom. I just received it yesterday after it was back-ordered for a month and a half … and the color is totally wrong. Now I’ve got to send it back. I may have to resort to painting my own rug! Oh no! So sorry it didn’t work! It looks so pretty! Have you thought to try any of the rugs, running the other direction? What feels “off” to me is the way they have always been positioned. I think the longest part should run parallel to the fireplace. I just saw that maybe its an issue with the stools. Would a 4X6 work? The current one there (in the first pic) is 4 x 6 and it just looks too piddly. Will keep you posted when we land on something! What a fun idea! I wish we had Home Goods up here in Canada! I’ve been searching for rugs as well. The perfect rug will soon find a new home with you — that’s my fortune teller impression and prediction!! My vote would’ve been for the ikat rug but I totally know what you mean about things looking better in photos than in person. We actually want to get a new rug for our living room (the current one is an off white from around 2 years ago and just hasn’t held up the way we hoped). Maybe IKEA or Pier1 has a nice rug?? I actually HAVE that ikat rug in my kitchen although we went unconventional and put the runner version in there that runs the length of the cabinets (it’s an old house and a funny shaped room). And of course, just a couple days after I set it up I dropped butter on it which I still can’t really get out though it currently blends in with the white splotches hah. Oh man- sorry about the butter! I’m jealous you got to keep him- I loved him so much but he just didn’t work for the room. Wah.